The growing British migration to New Zealand in the 19th century had substantial consequences for the island nation, pushing the British to establish increasing governance in the colony. From first European contact in 1769, through to a claim of Māori sovereignty in 1835, the increase in the number British migrants in New Zealand led to the subsequent claim of British sovereignty in 1840. This essay will explore the events leading up to the formation of a constitution for New Zealand, the Constitution of New Zealand Act (1852) itself, the decades following the act and the ongoing political consequences. Although it appears as though New Zealand had a formal written constitution, it was to be short lived, favouring pragmatism over ideology. Britain was increasingly intervening in the affairs of New Zealand due to the growing population in the first half of the 19th century. James Busby was appointed as resident of New Zealand in 1833 (Moon, 2013). This was perhaps the first step in establishing an official presence in New Zealand. Later Busby cobbled together the Declaration of Independence, and although he only managed to get a few chiefs to sign the document, it established Māori sovereignty over New Zealand (Declaration of Independence, 1835). An increase in the number of British subjects forced Britain’s hand, and it reluctantly became involved in the affairs of New Zealand. By 1838, British parliamentary select committees had begun debating intervention in New Zealand (Moon, 2002). The Treaty of Waitangi established British sovereignty over New Zealand, and allowed Māori some degree of autonomy to make decisions for themselves, as well as establishing the right of Māori to sell their land to British government agents (Treaty of Waitangi, 1840). An 1846 constitution was proposed and partly implemented for New Munster (Wellington and the South Island) and New Ulster (the rest of the North Island), with respective legislative councils and governors. Full implementation, however, was stalled in order that Māori be assimilated into British life (McKinnon, 2012b). This assimilation was not to be realised before the implementation of a full constitution for New Zealand in 1853. The Constitution of New Zealand Act 1852, proclaimed in New Zealand in 1853, establishes a functional set of ‘organs of state’ in New Zealand. The first few sections of the Act pertain to establishing six provinces and provincial councils (Constitution of New Zealand Act, 1852). The rational behind the strong provincial system lay in the relative difficulty moving around New Zealand (Moon, 2013). Later sections of the act establish the legislative council and the rights and responsibilities of the governor. 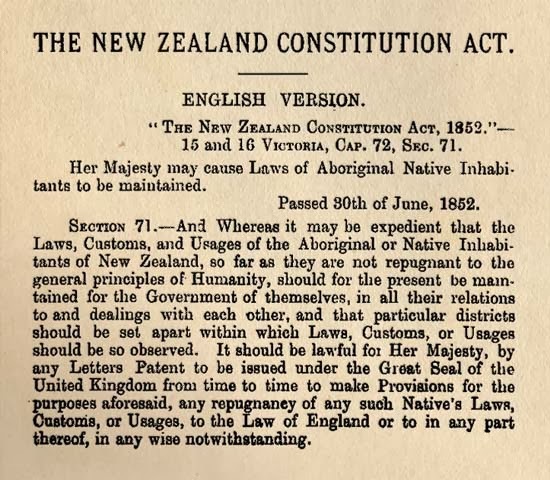 Section 71 had special provision to allow Māori to govern themselves so long as “the laws, customs, and usages of the Aboriginal or Native inhabitants…are not repugnant to the general principles of humanity…” (Constitution of New Zealand Act, 1852, s. 71). This section of the act would have allowed Māori provinces, however it was never implemented (Mein Smith, 2005). Māori and British settlers could vote, however one was required to own land, and only a handful of Māori were able to participate in elections (Ballantyne, 2009). These ‘organs of state’ would be tested, revised and repealed as New Zealand’s political and economic climate changed over time. For a brief moment, it appeared that New Zealand had a single legal constitutional document in 1852. This may ignore the constitutional significance of the Declaration of Independence and the Treaty of Waitangi, although it has been argued that neither of the documents are legal instruments (Palmer, 2008). Even if New Zealand did have just one constitutional document, this was to be short-lived. The New Zealand Constitution Amendment Act 1857 allowed the general assembly of New Zealand to amend a great majority of the Constitution Act (Constitution Advisory Panel, 2013). By the 1870s many of sections had already been repealed by subsequent acts (Constitution of New Zealand Act, 1852). By 1874, Julius Vogel, then Governor of New Zealand, had a plan to abolish provincial councils, which passed through the legislative council in 1975 (McKinnon, 2012a). Hence set forth the manner in which constitutional change would occur in New Zealand. Finally, in 1947 the final vestiges of constitutional-colonialism had been shed, with the enactment of the New Zealand Constitution Amendment (Request & Consent) Act. This act allowed New Zealand to completely alter it’s own constitutional law (Constitution Advisory Panel, 2013). This pragmatic shift to greater autonomy has left New Zealand with its ‘unwritten’ constitution that continues through to today. New Zealand’s constitutional development has evolved from entirely British in origin in the 19th century, to increased independence in the mid 20th century. The Treaty of Waitangi set the path for British sovereignty over New Zealand, and the Constitution of New Zealand Act cemented a governance structure, including provincial councils and a legislative council, in the new colony. Subsequent amendments, repeals and newly enacted law contributed to an ever-growing body of constitutional law. Eventually, the colony realised full constitutional sovereignty, however New Zealand retains this pragmatic approach to constitutional law today. Ballantyne, T. (2009). The State, Politics and Power, 1769-1893. In G. Byrnes (Ed. ), The new Oxford history of New Zealand (pp. 99–119). South Melbourne, Australia ; New York: Oxford University Press. Mein Smith, P. (2005). A concise history of New Zealand. Cambridge ; New York: Cambridge University Press. Moon, P. (2002). Te ara ki te Tiriti: The Path to the Treaty of Waitangi. Auckland, N.Z: David Ling Pub. Moon, P. (2013). Turning points: events that changed the course of New Zealand history. Auckland: New Holland. Palmer, M. (2008). The Treaty of Waitangi in New Zealand’s law and constitution. Wellington, New Zealand: Victoria Univ. Press.